The extra large pennants are 12 in. x 18 in. and come in a variety of colors as well as Red White and Blue. 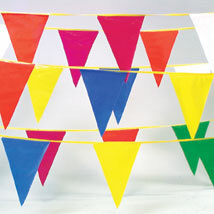 These pennants are weatherproof and double stitched for extra durability on 260 lb. rope. 100 feet long with 48 pennants per string.